In many ways, two Americas voted Tuesday: One that is large, white, and shrinking; another that’s far smaller, more racially, ethnically and culturally diverse -– and growing inexorably. Look back a generation: 91 percent of voters in 1990 were white. Tuesday, 72 percent were white, the fewest on record for midterms in exit polls dating to 1982. Twenty-eight percent were nonwhite -– triple the level 28 years ago. Within-group results, notably by age, widen the picture. Among this week’s voters age 65 and older, 82 percent were white. Among 18- to 29-year-olds, that fell to 56 percent. Blacks, Hispanics, Asians and those of other or mixed racial or ethnic backgrounds accounted for 44 percent of the youngest voters. 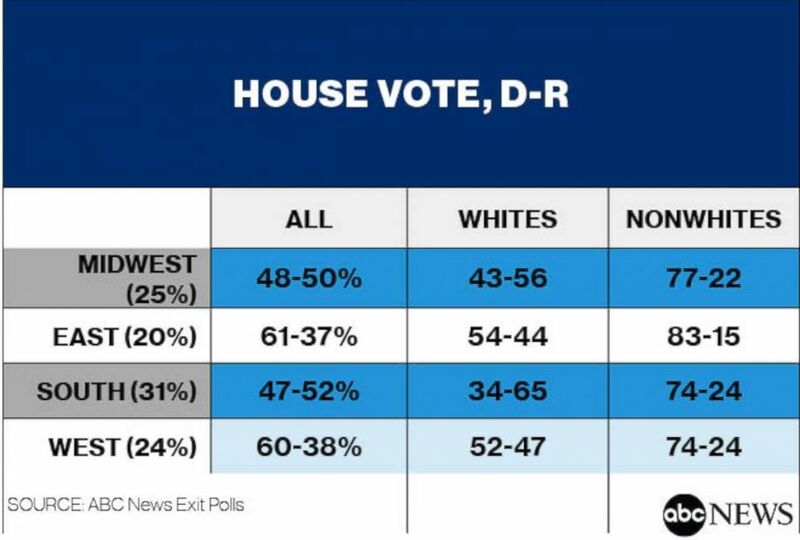 This doesn’t chiefly represent higher turnout among nonwhites; it reflects the fact that there simply are more of them in the nation’s younger population. Demographics rule: As time progresses and the older cohort moves on to the big polling station in the sky, diversity will rise. Politically, it matters. 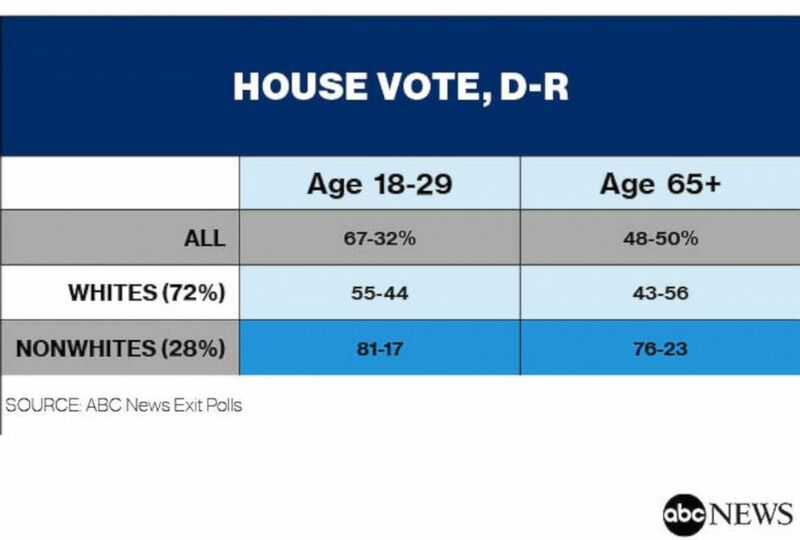 More-diverse young voters backed Democrats for the House by 67-32 percent this week, their largest Democratic margin on record in any exit poll, midterm or presidential, since 1976. Seniors, by contrast, split 48-50 percent, Democratic-Republican. What’s often missed in discussions of the age gap is that it’s largely racial and ethnic in nature. Young whites voted 55-44 percent (Democrat-Republican); young nonwhites, 81-17 percent. Among seniors, whites voted 43-56 percent; nonwhites, 76-23 percent. The bigger difference by far is not age, but the racial/ethnic composition of the age groups. The large size of the exit poll lets us look at nonwhites beyond blacks –- who voted Democratic by 90-9 percent –- and Hispanics, 69-29 percent (with their turnout a record midterm high). Asians, 3 percent of voters, voted Democratic by 77-23 percent, their widest Democratic margin in available exit poll data dating to 1990. American Indians voted Democratic by 10 points; those of other races, by 19. Look, too, at the distribution of these groups by age. Among whites, 24 percent on Tuesday were under age 40. This rose to three in 10 blacks, American Indians and people of other racial or ethnic backgrounds; 41 percent of Hispanics; and 44 percent of Asians -– further clear evidence that future is a more diverse one. The level of diversity varies by age groups (higher among younger voters, lower among older), but it also varies by the urban/suburban/rural split. Eighty-five percent of rural voters Tuesday were white. So were 75 percent in the suburbs and seven in 10 in small- and mid-sized cities. In the nation’s large cities (of 500,000 or more), by contrast, 48 percent were white. A majority of big-city voters, 52 percent, were nonwhite. Big-city dwellers voted 76-22 percent for Democratic over Republican House candidates, the widest Democratic margin by far in these groups. Indeed it’s a challenge to the Democrats that their vote is so urban-based, rather than well–distributed across metro and geographic areas. 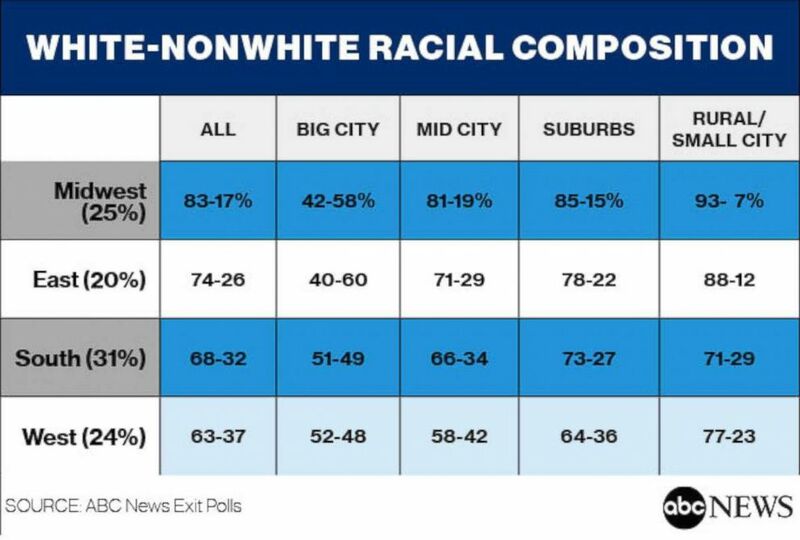 There does look to be an independent metro-status effect: Big-city residents are a strong Democratic group regardless of race, even if more so among nonwhites than whites. And it’s notable that 37 percent of rural nonwhites voted Republican. 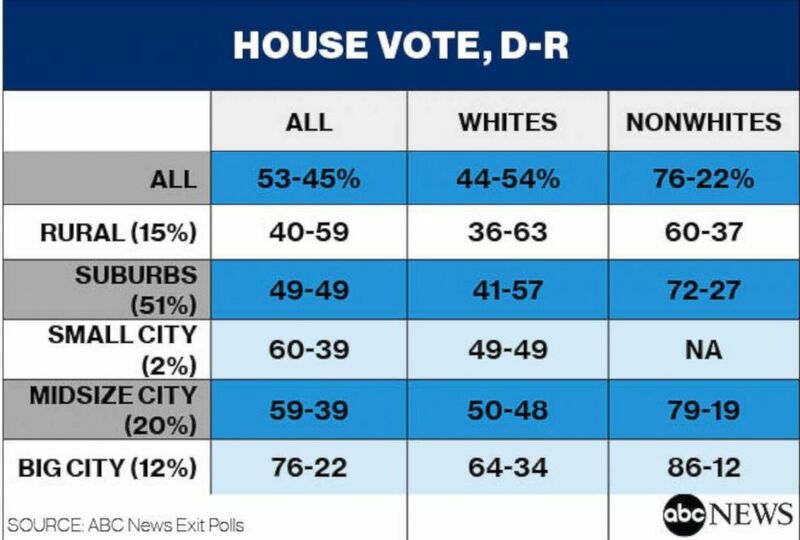 But the critical suburbs, home to half of all voters, show a striking difference: White suburban voters favored GOP candidates by 16 points; nonwhites in the suburbs voted Democratic by 45 points. It’s not suburban voters in general that made it a close contest there. 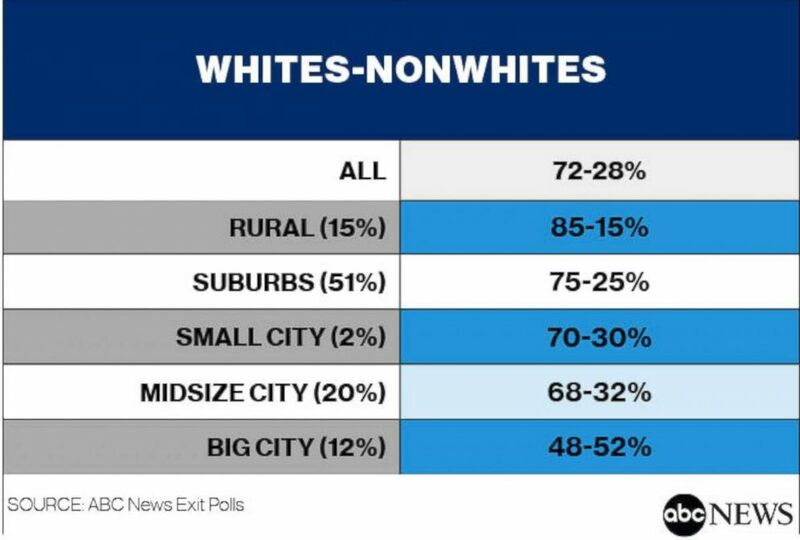 It’s the differential population sizes and vote preferences between white and nonwhite suburban voters. One last slice is by region. Eighty-three percent of voters in the Midwest on Tuesday were white, compared with a low of 63 percent in the West. Suburban, mid-size city and rural Midwesterners all were overwhelmingly white; yet voters in Midwestern big cities were majority nonwhite. It’s a similar story, if not quite as pronounced, in the East. Big cities in the South and West, instead, are more racially and ethnically mixed – indeed, closely divided between whites and nonwhites. Looking at region by vote, we see some differences among whites – compare Southern whites and Midwestern whites, +31 and +13 points Republican, respectively, with Eastern and Western whites +10 and +5 Democratic. But the vast gaps are between whites and nonwhites -– and as the age-by-race results by show, more nonwhites is where the population is heading. These results provide both a roadmap to the present -– and a portent of the future. Nonwhite voters overwhelmingly support Democratic candidates and have done so for decades. The exit poll makes clear that their numbers are on the rise. To avoid more and bigger blue waves, now more than ever, the Republican Party needs to break out of its own white bubble.